The timeless broadcloth long-sleeve dress shirt in a classic, generous fit with a tough of added stretch. Also features a hidden elastic tab that stretches to give you up to 1" extra at the neck, guaranteeing you feel as good as you look. 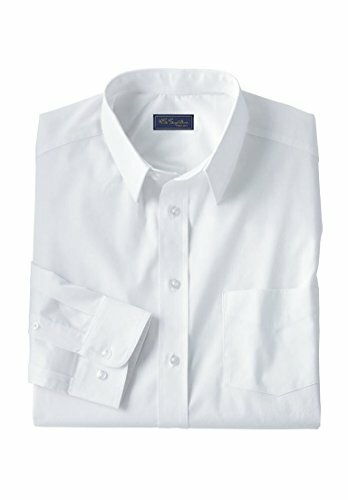 Classic, stretch fit Expandable tab collar provides 1" extra width Dyed-to-match buttons Chest pocket Easy-care cotton/polyester broadcloth Machine wash; imported Tall center back length abt. 36"Big center back length abt. 34" Our Expert OpinionThis dress shirt features adjustable cuffs for comfort and a shirttail hem for added length that helps keep it tucked in. Pick your favorite color and stock up!